I am taking a few days of educational vacation to attend the Riesling Rendezvous – an annual international Riesling symposium – in Seattle. What is unique about this event is the scope of it: all Riesling from all over the world. There are wines from Germany and Washington State, from France and Austria and Australia, from New York, Idaho, and Oregon, from Canada and Michigan. Suffice to say that I am tasting a lot of Riesling while listening to the producers and other experts talk about the state of Riesling in the wine world today. Maybe not the most thrilling stuff but interesting and for me educational. While Tuesday’s big blind tasting of “other than dry” Rieslings is the most interesting to me, I found a huge surprise in Monday morning’s blind tasting of 20 dry Rieslings from literally all over the world. Hidden (and tasted absolutely blind) among wines priced mostly between $20 and $100 per bottle was Chateau Ste. 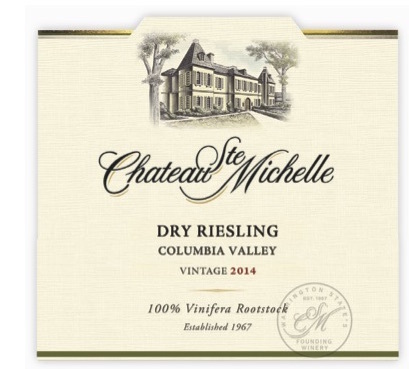 Michelle Dry Riesling Columbia Valley 2014. The assembled conference participants were extensively buzzing about the wine before its identity was revealed. There was a huge murmur of approval and congratulations at the reveal. I was and am stunned at the quality of this wine at this price ($8.19 per bottle at Spec’s). Here is that rarest of all unicorns, the great wine made in commercial quantities sold at an every-day price. 100% Riesling night-harvested from a mix of vineyards in Eastern Washington’s Columbia Valley AVA. Fermented cold in stainless steel tanks to a residual sugar of 0.84 g/100 ml (less than 1%) and a total acidity of 0.72 g/100 ml with a pH of 2.88 (very low). What does all of that mean? This is a dry Riesling that nevertheless offers plenty of fresh, focused fruit flavors and aromas in the citrus range with complementary notes of apple and peach over an indeterminate mineral core. It is frankly delicious and quite refreshing. It shockingly fit into the upper tier of the quality range of the international Dry Riesling tasting, even though it was far-and-away the lowest priced of the 20 wines tasted. Think of this as wine for oysters or mussels (say at La Vista) or not-too-spicy shrimp dishes. Take it with you to Asian BYOB restaurants (think Vietnam in the Heights). BearScore: 93+. *At Spec’s 2410 Smith Street in Houston. Price will vary by location but should not exceed $10.00 in any case. I’m anxious to check this wine out with food at La Vista or Vietnam. Thanks for the recommendation. thank you very much for the lesson and for sharing your fabulous finding….